Some extreme halophiles can obtain limited amounts of energy from light. 1. 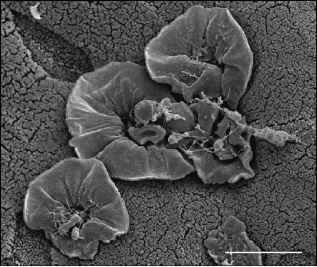 Methanothermus species are hyperthermophiles that generate methane. 2. Sulfur- and sulfate-reducing hyperthermophiles are obligate anaerobes that use sulfur (or, in one case, sulfate) as a terminal electron acceptor. They include the genera Thermococcus, Archaeoglobus, Thermoproteus, Pyrodictium, and Pyrolobus. 1. Thermoplasma and Picrophilus species have an optimum pH of 2 or below.